Thanks re the fin suggestion... I think the whole fin story is interesting. Firstly the question is do they really make such a big difference... ie if you have a board that is a turd putting a fancy fin in does just make a polished turd? More importantly though It's interesting that fins are almost the single most expensive part on a windsurf kit you can't actually test before you buy it. Thanks for the vid Thomas yes I agree fins have nothing to do with the tack, just some friendly banter with Al. I do have a very nerdy interest in fins and have dribbled heaps of sh1t on the UK forums re tow in angles etc. Designed wave fins and had them cnc shaped in the US. I like taking 2 or 3 boards down the beach for back to back nerdy fin testing. 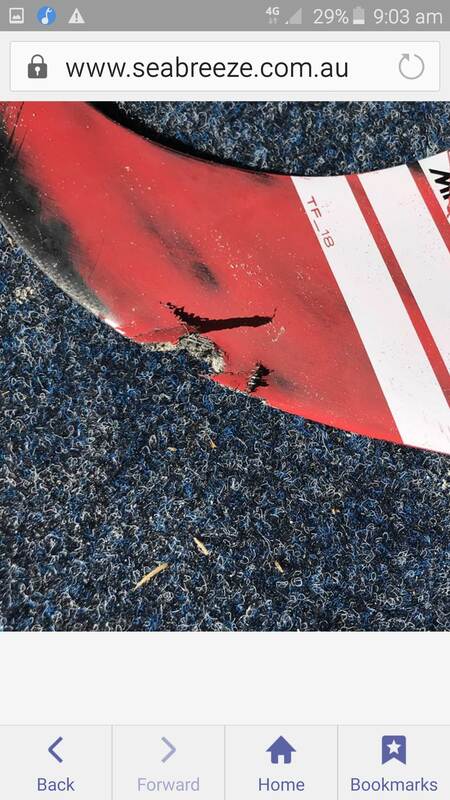 Yep I agree a cr4p board wont go any better with a performance fin but I think an awesome board will suffer from rubbish fins. I can only talk about single, twin and quad configurations as i have only dabbled with thrusters in the early 90's. Ive used some fatter poorly foiled fins and the board feels like it has a bit (not alot) of seaweed on it as in its slower to plane, slower top end speed. Ive come into the beach swapped to some thin foiled G10 fins and the board pops on the plane super fast. There's now soooo many variables with multifin boards the set ups and configurations are mind blowing re front to rear size ratios, tow angles, outline shapes, fin spread, fin box position as in width apart, closeness to the rail, box spread, so many variations that translate to different feels in the board's performance, just mindblowing to me. A positive of the plastic fins is their light weight. for me I love love love the pivot off the tail in the top turn that stiff G-10 mains give you. I feel a big difference between G-10 and moulded glass, so plastic is just too bendy. Maybe that is just a fatman perspective. However I am bemused that we spent 30 years going away from moulded plastic due to it being too bendy, and suddenly people are happy with it again so I wonder if for many it is a price motivated decision and also as the difference is not easily noticed in a 9cm side fin ? I also don't rate very highly at all the marketing statement that so many pro's used a certain moulded plastic fin, in the same post that shows a pic of a big single fin..... it makes noobs think you can make a 50cm fin out of recycled coke bottles and its the same as a $400 carbon. But clearly they are talking about small wave fins and paid riders. When was the last time u saw a paid rider or particularly a magazine slam ANY product? OTOH if the new thermoplastic is stiff enough to make a 30+cm freeride fin work maybe I need to try some. Yes indeed- you can't polish a turd, but you can roll it in sugar. Injection moulded thermo plastics have come a long way in the last 30 years. The machines alone are like something out of Star Trek when compared to the dinosaurs they used 30 years ago. But yes a 50 cm fin won't be made from straight injection moulded plastics for the foreseeable future. You could make one with a composite core but the price would defeat the purpose. somebody already mentioned it. The red ones are no longer produced, they were the first version and purportedly having issues (as in: easily getting destroyed). The new versions (RTM2) are black now. So if you were asking for red ones, that's why you might not have found any (I have been there myself). 2) contact Pascal at the Goya / Quatro headquarters on Maui. They have usually have mfc fins in all kinds and sizes. They even might still have the red ones, if you are willing to trade beauty over functionality. They might both charge you for shipping, but a fin can't be too expensive, right? Is k4 pro riders are using stock fins or Custom fins? K4 are injection moulded fins. While you could do custom moulds there is little point. Once you have made the mould you may as well spit out more fins. The cost of the plastics is negligible. That's not why I mean. Do they use plastic fins or custom fins painted as plastic fins? have also contacted mfc direct to see if I can source 17 & 18 tf2, g10's. None of the other links above for mfc worked out for the sizes! I've bought MFC fins from them before. Good service, quick postage to Oz. K4 have a large number of multi fins, suitable for Tri fin boards, the center have options , Stubby, Rocket OR Scorcher . K4 offer different stiffness on certain fins ,fins with asymmetrical foils and fins with 0 1 2 3 degree of toe in. Dont think Geoff will be fixing it Mark, I saw it 10 minutes after it happened. It has at least a 10mm deep puncture three quarters the way up so unless he's very creative with a grinder and sand paper its rooted. It is the fin that was damaged! Mark fixed it! I think they are Hi Tech plastic composites fins, painted to look like G10, painted then too look like K4s, to confuse the competition , using different combinations of dynamic flex, the super stiff having 15% heavier then the dynamic versions , both having similar feel to G10, but better reflex and better damping through chop. K4 specialize in revolutionary innovative performance , for those that can think outside the box, and like to spend half so much as some of the competition . The broken tab was no issue as I wanted slotbox anyway. Clever man, not so rooted. Hey Mark - that looks like new! 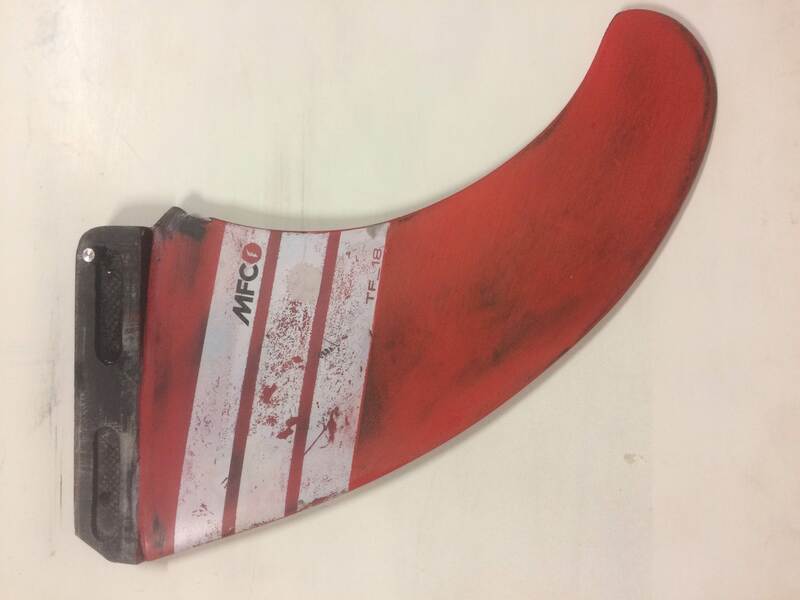 i need to repair the leading edge on a few MFC fins in a similar state - can you explain what you need / did? Well, I would love to think outside the box, but hesitant to ordered. I contacted them for a suggestion and might order a pair. I do know a few riders who bought them, then they are not riding them...and when I ask...they say they are good, but they don't know why they don't ride them.... I'm targeting the Leon to go with my skaty Kode Wave 87 for mushy waves and side-on. What do you think forceten? I guess I won't use them in forceten wind but maybe forcesix..will see.